The crazy looking horror comedy from Montetré is here. ZOMBIE CATS FROM MARS looks just as insane as it sounds and there is no way in hell you can pass up looking at this trailer. The indie flick stars Ernest Adams and is being backed by MWB3. ZCFM plans on being released sometime in 2015 so for now enjoy the trailer, stills and one sheet. 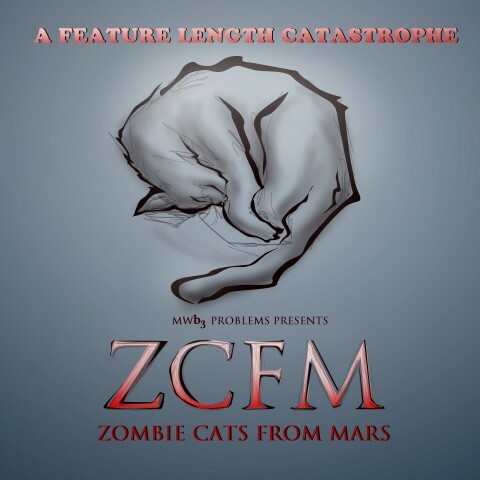 BURBANK, CALIFORNIA : MWB3 Problems has laid out the galactic kitty-litter for its upcoming horror-comedy Zombie Cats from Mars. Directed by Montetré (Holed Up) and written by Ryan Cloutier, the ‘catastrophe’ – which came together thanks to a successful crowd-funding campaign on Kickstarter – is due for release early this year. Portlandia’s Ernest Adams stars alongside Jonah Kersey, Stephanie Leet, Bransen Sands Koehler, Julie Marie Howard, and Edward Kopf in fun horror romp that’s part Gremlins, part Critters. Since it’s a movie about cats, writer and producer Cloutier furnished the support roles with furrier thesps. Marci Koski, an animal behavior specialist and volunteer with Furry Friends, supplied animal talent for the film. The story centers on Billy, an effeminate fan of vintage science fiction action thrillers. His only friend is Cameron, a nerdy film buff who tries to boost his confidence whenever he can. After seeing a UFO land, Billy retreats into his head, imagining that aliens are taking over the town. Cameron is skeptical, as is the rest of the town. Meanwhile, people are starting to die. First, the reclusive cat lady Percis is discovered mutilated by Lester, the church -­‐going husband of Carolyn, Percis’s depressed caretaker. Random deaths soon follow, first a jogger, and then a janitor at the Carbonics Warehouse. A pair of news reporters shares this information with the public while the Detective and his Chief try to solve the killings. Meanwhile, the killings continue. Billy, wrapped up in a world of fiction, discovers a story in which Martian Cats land on Earth and inflict horror upon the town. Confident that the killings are the result of the UFO delivering alien cats, he sets off on his own superhero mission to save the town.